Shares of the cosmetics company tumbled on a weak quarterly earnings report. Shares of Coty (NYSE:COTY) gave up 21% last month, according to data from S&P Global Market Intelligence. The cosmetics maker plummeted on a disappointing first-quarter earnings report as its performance was hurt by supply chain issues. Just days after that report, the Cover Girl parent named a new CEO, saying outgoing chief Camillo Pane was stepping down due to family reasons. 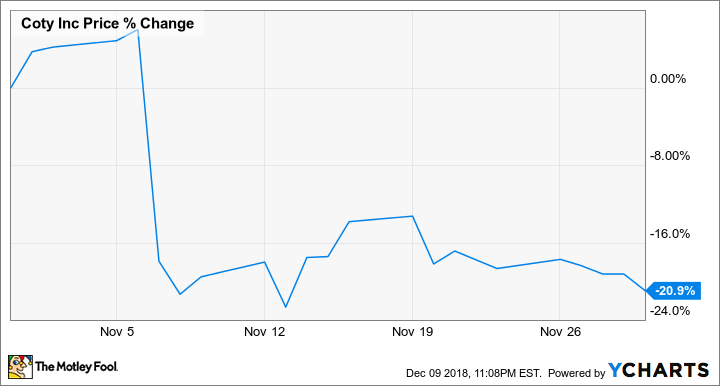 You can see from the chart below that essentially all of the stock's losses came on Nov. 7 after the earnings report. Coty said overall revenue fell 9.2% in the first quarter to $2.03 billion, badly missing estimates at $2.17 billion. On an organic basis, which strips out the impact of acquisitions and divestitures, revenue was down 7.7%. The company said it encountered several supply chain headwinds, including warehouse consolidation disruptions, component shortages from certain suppliers, and disruptions from Hurricane Florence. Costs rose as a percentage of revenue as well, and adjusted operating income fell 28% to $140.8 million. On the bottom line, adjusted earnings per share increased from $0.10 to $0.11 with the help of a $0.04 tax benefit, which beat estimates at $0.08. Pane said: "We are very disappointed with the supply chain disruptions that we have experienced over the last quarter and the resulting poor Q1 financial performance. While we had anticipated some level of disruption in the first quarter from warehousing and planning consolidation, the increased scope of the disruptions resulted in much weaker results than previously expected." Pane added that the supply chain issues would weigh on second-quarter results and mostly be resolved by the third quarter. On Nov. 12, the company made the surprise announcement that Pane would be replaced, effective immediately, by Pierre Laubies, who was previously the CEO of Jacobs Douwe Egberts (JDE), the coffee company. Laubies brings experience integrating Mondelez's coffee business into JDE, which was likely appealing to the Coty board as the company's major challenge now is integrating Procter & Gamble's beauty brands, which it acquired in 2015. Coty shares are down around 70% since it made that deal as management has struggled to deliver the hoped-for synergies. In its guidance, management said it expected revenue trends to improve in the current quarter and that adjusted operating income would be moderately lower. For the fiscal year, the company said it still expected operating profit and margins to grow. However, with the supply chain issues and a new CEO coming in, there's a lot of uncertainty around the stock right now. Expect more volatility.